The Spring 2016 Truman Lecture in Missouri marks the 75th anniversary of the founding of the Missouri Lodge of Research. 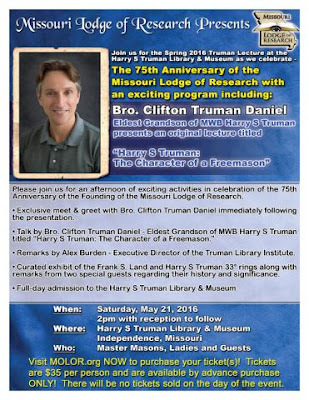 To celebrate, this year's program will feature Brother Clifton Truman Daniel, who will present, "Harry S Truman: The Character of a Freemason." The afternoon event will be on Saturday, May 21st, beginning at 2:00 PM. It will be a private reception at the Harry S Truman Presidential Library and Museum in Independence, MO. Also at this event will be remarks from Alex Burden, Executive Director of the Truman Library Institute, and a never before seen exhibit of both silver 33° Scottish Rite rings of MWBro. Truman and "Dad" Frank S. Land, founder of DeMolay International (as well as a surprise guest to explain their history and significance). There will be a private reception following the presentation, with hors d'oeuvres available, until 4:30, during which you will be able to meet the speakers, as well as see the rings up close. Tickets are $35 per person, and must be purchased through the Missouri Research Lodge's Eventbrite webpage HERE. The Truman Library and Museum is located at 500 West U.S. Highway 24, Independence, Missouri 64050. Brother Clifton Truman Daniel is an author, lecturer, and the oldest grandson of President and Past Grand Master Harry S Truman. (His father was Clifton Daniel, former Managing Editor of the New York Times, and his mother was Margaret Truman, the President's daughter, who was a very successful mystery novelist.) Brother Daniel is a member of Oriental Lodge No. 33 in Chicago. 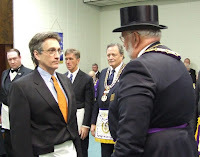 He was made a Mason "at sight" in 2011 after receiving the full Master Mason degree by then Grand Master of the Grand Lodge of Illinois, MW Terry L. Seward, at a special joint ceremony in Joliet, Illinois, with the assistance of the GM of Missouri, MW John W. Hess. The Missouri Lodge of Research was chartered by the Grand Lodge of Missouri, AF&AM on September 30, 1941 under the direction of MWB Harry S. Truman. The Lodge gathers and disseminates, by discussion and/or publication, information primarily of historical character pertaining to the origin and development of Freemasonry and to the members who have contributed to its growth and development. Any Master Mason may join - if living in Missouri he may become an Active Member, if in another jurisdiction, he becomes a Corresponding Member. Dues are $25, and members receive the annual book published by the Lodge.